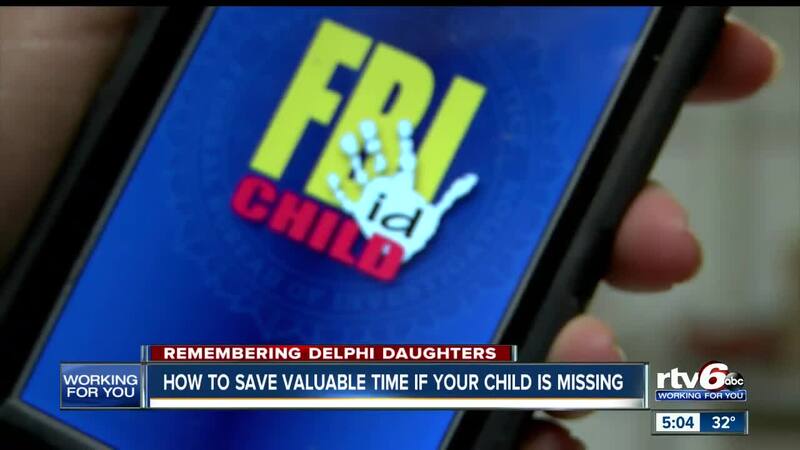 How to save valuable time if your child is missing. INDIANAPOLIS — More than 400,000 kids go missing in the United States every year, according to the National Center for Missing and Exploited Children. The FBI said every 40 seconds a child goes missing in America. They say to download the FBI Child ID app. The app asks you to put your child's basic information in, as well as identifying characteristics of your child. The FBI does not store this information, but they say this is critical to have so you can give the police if a search begins for your child. Diving further into the app, it also shows what you should do within the first 48 hours if your kid goes missing. For example, request a 'Be on the Lookout Bulletin' and create lists of who may have seen your child around the time of the abduction. The metro police also have the child ID's. It has the basic information and can include dental records, fingerprints and DNA. The DNA collected is from your child's hair, but the root on the follicle needs to be attached. In Boone County, the sheriff's office has two bloodhounds with an extreme sense of smell. If your child goes missing, the dogs will track your kids using free scent kits that are now available to the public. Speaking of tracking, police say to make sure you have an app that will track your child's phone. Some simply show their location, but others can notify you when your child gets to school and makes it back home. The state says you and your children don't need to live in fear of abduction, but should stay alert and prepared.